Watch this video to see an overview of how to recharge an air conditioning system in any modern vehicle. I am using the A/C Pro recharge hose, gauge, and refrigerant. The product can be found HERE. Earlier this year in our Chevrolet Traverse, the air conditioning started to get a little on the warmer side, and throughout the summer has all but stopped working. I was afraid that a more major issue was the cause but was hopeful that topping the system off with some r134a would solve the problem. So far, the air has been working excellent since the recharge and I am hoping that no major leaks are present. 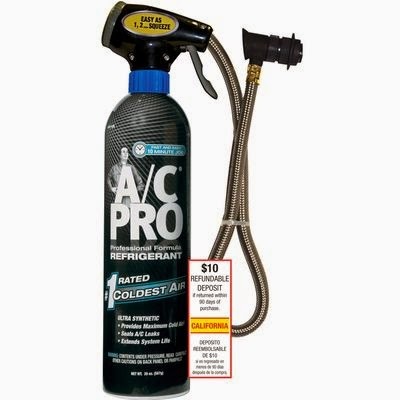 The AC Pro kit comes with the gauge and coolant that you need to complete the job from start to finish and only takes about 10-15 minutes to complete. This process should hold true for just about any vehicle with an air conditioning system manufactured after 1995. The hardest part, in most cases, is just locating the correct service or fill port on the vehicle but, luckily, it is pretty dummy proof.. The hose will only fit on the correct fitting so as long as it fits easily and clicks into place you should be okay.